A new interactive map from the Kaiser Family Foundation compares county-level estimates of premiums that consumers would pay under the Affordable Care Act (ACA) in 2020 with what they’d pay under the Senate’s discussion draft, Better Care Reconciliation Act (BCRA), a replacement plan unveiled last Thursday. The maps include premium and tax credit estimates by county for current ACA marketplace enrollees at age 27, 40, or 60 with an annual income of $20,000, $30,000, $40,000, $50,000, $60,000, $75,000, $100,000, or 351 percent of the federal poverty level (which is just above the cutoff for tax credits under the BCRA). The map includes estimates for premiums, tax credits, and premiums after tax credits, for bronze and silver marketplace plans in each county in 2020. Both the ACA and the Senate’s bill include tax credits to help consumers pay premiums for individual insurance. Both take into account family income, local cost of insurance, and age in calculating tax credits; however, they differ in how they determine the percentage of income an individual must pay toward their premium. The ACA and Senate bill also base tax credits on different benchmark plans, with the Senate bill tying the credits to plans with higher cost sharing for consumers. 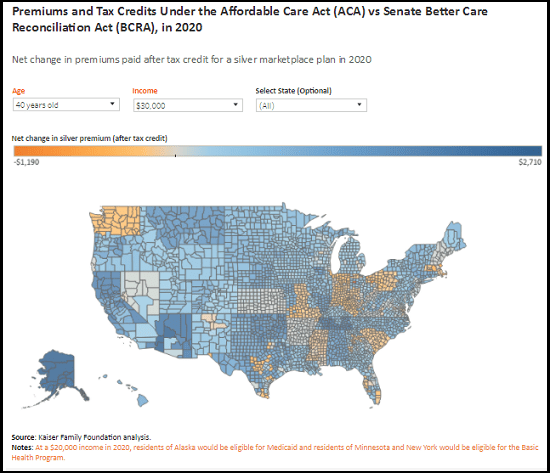 An earlier map from the Foundation compares ACA premiums and tax credits to those in the House-passed American Health Care Act. Also new from the Foundation: a detailed summaryof the Senate’s new discussion draft, the Better Care Reconciliation Act, a plan released Thursday to repeal and replace the Affordable Care Act (ACA). Users can compare the Senate bill to current law and the House-passed American Health Care Act in 17 key areas of health policy, including Medicaid, premium subsidies to individuals, state role, financing, women’s health, and individual health insurance market rules.